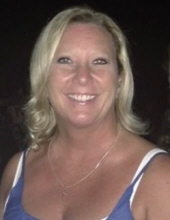 Leslie Denise Perian Van Fleet, 46 of Knoxville, TN went to join her sister, Shelley Perian, and Father, Tommy Perian, in heaven Oct 31st. Leslie leaves her loving family; son, Alec Van Fleet, daughter Gracie Van Fleet, the children’s father, Stephen Van Fleet, mom, Gail Perian, and second dad, Gary Lemasters, sister, Amanda Allen, aunts, uncles, and cousins and many special and close friends. Leslie had a Bachelors degree from Tusculum University and was an Accountant at Edgewater Technical Associates of Oak Ridge. She loved life and was always smiling, cracking jokes, and fun to be around. The love of her life is her children. Leslie’s wish was to be cremated. A celebration of Life will be held at Bethel Presbyterian Church, 203 South Kentucky Street, Kingston TN, at 6:30 Wednesday evening. Friends and family please bring your memory of Leslie or funny story of her to share. Let’s celebrate the joy she gave to us during her life. In lieu of flowers we are asking for donations to an Angel Tree. You can find them at the mall or at Wal-Mart. To send flowers or a remembrance gift to the family of Leslie Denise Perian Van Fleet, please visit our Tribute Store. "Email Address" would like to share the life celebration of Leslie Denise Perian Van Fleet. Click on the "link" to go to share a favorite memory or leave a condolence message for the family.